Woo Hoo, it's Friday!! Glad to be a part of the hop! I've popped over from the Blog Hop! Lovely to meet you and discover your new-to-me blog. I'm your latest follower. If you'd like to drop by, please visit us here! I hope you have a great weekend! I was going to become I follower, but for some reason it says that the gadget is not working. Coming over from Bloggiesta but couldn't find your post:) So commenting here! Great blog! Good Luck this weekend! Hi! 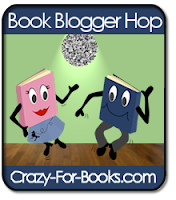 I am following from the book blog hop. I am starting a new book club "The Lemon Verveine Book Club". Why don't you check it out when you get a chance?! Thanks! Stopping by to say a bloggy hopping HI! Just hopped by and have added you on my google reader. I could not manage to get my blog hop post this week but there is always another week!